The Gemelli Compact is a contemporary bathroom basin which is ideal for installation in bathrooms where space is limited. Featuring a simple, yet elegant and functional design, it is a great choice for modern bathrooms. The Gemelli Compact bathroom basin is designed to offer easy installation, and it is supplied with a 32mm chrome pop-up waste. 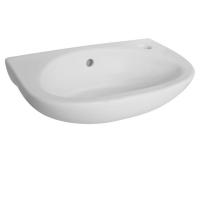 It features a bowl capacity of 3.8 litres and measures 400x290mm in dimensions. 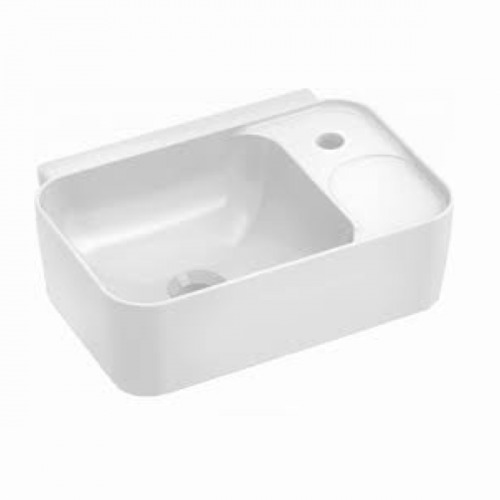 Suitable for use with mixer taps, it does not include an overflow but includes a single tap hole and offers a generous soap platform for added functionality. Enjoy the highest standards of quality with the Gemelli Compact bathroom basin. It exhibits superior artistry and top quality of manufacturing due to which it offers a long life. 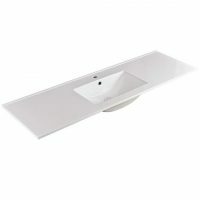 For a compact basin for contemporary bathrooms in Perth, you’ll find nothing better than the Gemelli Compact basin at Ross’s Discount Home Centre. 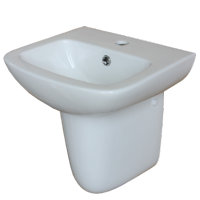 Buy this elegant bathroom basin at the lowest possible price from our online store and take advantage of our 14-day money back guarantee!